There's just no way to sugarcoat this. The Heart and Stroke Foundation, and specifically their Health Check program, in their selling of check marks to so called fruit leathers and fruit gummis, is overtly harming Canadian children's health - a generation which quite literally is the sickest generation of kids in modern history. In the United States, the Center for Science in the Public Interest sued General Mills for their fruit roll up labeling, and yet here in Canada we see the Heart and Stroke Foundation selling its front-of-package Health Check to products like SunRype fruitsource bites where by weight they're 80% sugar, with sugar being responsible for 96% of their calories. And who buys these products? Parents for the most part, as consequent both to the Health Check and to the health washed package labeling that explicitly states that a serving of these candies replaces 2 actual servings of fruit, many parents truly believe that they're good for their kids. "'nutritious', 'healthy', 'good for you' or 'approved by the Heart and Stroke Foundation.'" "The Health Check logo tells you the food or menu item has been reviewed by the Heart and Stroke Foundation’s registered dietitians and can contribute to an overall healthy diet." You tell me, does this product's nutrition information suggest to you that it contributes to an "overall healthy diet"? Where's the fruit? All I see is sugar. And if after peeking at the nutritional information you're still on the fence consider this. I went out and purchased some NIBS for a comparison. Here's a photo of 30g (fruitsource's recommended serving size) of each. While no one would ever confuse NIBS with health or fruit, consequent to health washed labeling and that Heart and Stroke Foundation Health Check up top, many might confuse fruitsource with actually healthful fruit. 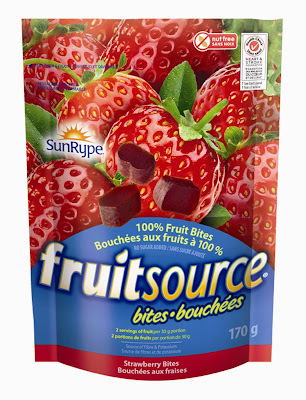 I wonder how many of those folks would be surprised to learn that per 30g serving the NIBS have 2.5 teaspoons less sugar than the fruitsource bites, which, bite per bite, contain nearly double the NIBS' sugar. If you're angry, feel free to click here to send your message of concern to Ms. Bobbe Wood, the President of the Heart and Stroke Foundation. Please share this post and/or the video above far and wide as this is not ok. The Heart and Stroke Foundation and their dietitians do know better, and we as a nation, and especially our nation's children, deserve better - way, way, better.